We are pleased to announce that we have secured a venue for the Edinburgh Fringe 2018 run of Shackleton’s Stowaway. 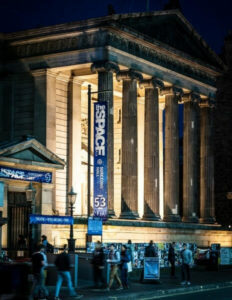 We’ll be performing at theSpace @ Surgeons Hall, a very exciting venue with a strong reputation for new writing and great entertainment. TheSpaceUK is one of the biggest venue chains at the Fringe and has enjoyed an increasing amount of awards and footfall over the last few years. Surgeons Hall is a beautiful, historic building in the heart of the Festival, and can be easily accessed from the Royal Mile. If you’re in town in August, we hope you’ll come along and enjoy a thrilling hour of theatre with Shackleton & co! Shackleton’s Stowaway will be performed at the Space at Surgeon’s Hall from August 3rd – 25th at 21:10, as part of the Edinburgh Festival Fringe 2018.